Tell us a little about Chincoteague Minnow and how he came to be yours? Minnow was born on Assateague Island in Virginia in 1993, making the swim during the annual pony penning that year he was sold as a youngster. He spent a few years on an amish farm before we went to live at the Chincoteague Pony Centre on Chincoteague Island, VA where he was broke to ride. He then made his way to a family that treated him very unkindly. 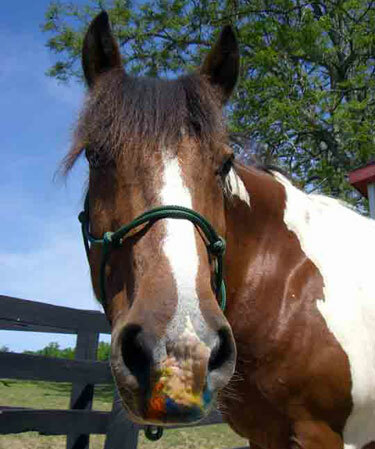 He was locked in a stall and nearly starved to death before he was discovered by The Nelson Family of Morgantown, Pa. He spent several years with the Nelsons recovering before he came to live with me in 2003. I had Minnow on free lease to be my mounted games pony for several years before the Nelsons gave him to me as a wedding present in October of 2008. When did he first start painting and what is the story behind his art? Minnow started painting on January 7, 2007. I had run out of tricks to teach Minnow, and being an artist myself, I thought it would be neat if I could teach my pony to paint too. That day I lugged an old easel and paints out to the barn and pretty soon Minnow had created his first work of art. Chincoteague Minnow is a trick pony too, what tricks does he perform? Minnow performs many tricks, some of his favorites are to play fetch and shake hands. He also enjoys standing on his pedestal (because it makes him feel taller) and he’s a very good pick-pocket. One of his most impressive tricks, and my favorite, was done when he performed as the “flower pony” in my wedding in October of 2008. He walked down the isle tossing flower petals out of a basket. 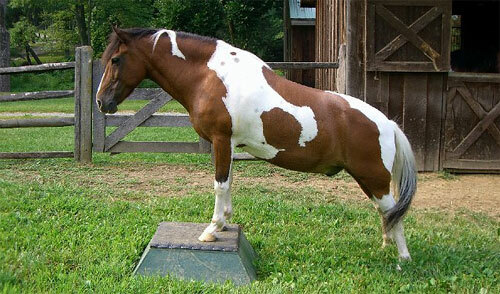 He’s currently working on a new set of tricks that he will debut at the Chincoteague Pony Centre this summer during the 2009 Pony Penning. A portion of his artwork proceeds are donated, can you tell us about the charity? A portion of Minnow’s sales is donated to the Chincoteague Pony Association. The money that they raise goes towards the care, maintenance, and support of the ponies for items such as feeding, veterinary bills, farriers, inoculations, etc. I feel that its important for Minnow to give back, and what better place to help than the Island Minnow was born on and the place where his relatives still reside. Was it difficult for him to pick up? Minnow actually picked up painting rather quickly. I simply taught him to hold the brush and touch it to the canvas, once he discovered that something happened when he did this – there was no stopping him. 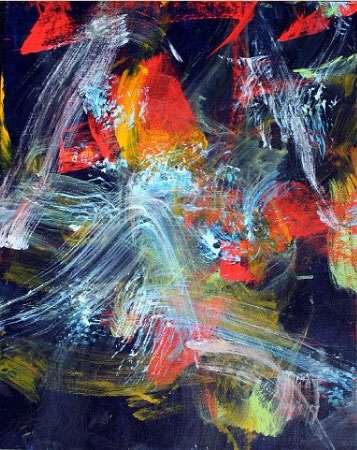 He began swirling the brush around on his own to make interesting patterns happen on the canvas. Interestingly though is that Minnow is VERY particular about what kind of paint brush he uses. He prefers only a specific brand with a specially designed rubber handle, he refuses to paint unless he has his “special” paintbrushes. Does he genuinely enjoy the artistic process? As soon as Minnow sees me bring out his easel and brushes he’s filled with excitement. He stands patiently at his easel as he waits for me to ready the paint and supplies. If I let him he would paint for hours on end, he never seems to tire of the process. Do you think that perhaps he is trying to communicate with you via his artwork? Sometimes I swear he is painting things that he sees. Last summer I brought home a new puppy that loved to lay under Minnow’s easel while he painted. So one day I decided that it might be nice to “ask” Minnow to paint a portrait of my puppy Trooper. I gave Minnow the colors he would need and wouldn’t you know a figure in the center came out looking like a dog with a person standing next to him. He’s painted others that look like prancing horses and several that resembled flocks of birds – perhaps he is reliving his youth on Assateague Island. 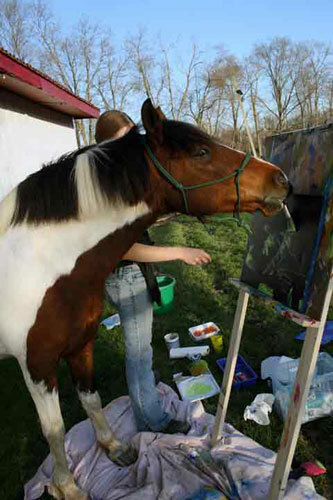 He continues to get commissioned works where customers will send in a photo of their horse for Minnow to paint a “portrait” of – some of them actually come out looking like a horse. Does he have a favorite piece? Minnow seems to really like to paint the bright colorful ones, his brush strokes get quicker and more aggressive. But if I had to say, I think his favorite piece might be “Flutter” which he painted in April of 2007. This turned out to be one of his most interesting paintings which was then auctioned off to benefit the St. Jude’s Children’s Hospital. Do you find Chincoteague Minnow appreciates art in general? I think that he knows that something is being created by him – I don’t think he would paint if the brushes didn’t have paint on the end of them – he understands that when that brush hits the canvas interesting marks are made from it, so in that respect I think he appreciates the process that goes into making art. I’ve found that when Minnow is painting, the other members of my herd begin to crowd around the easel (as sometimes we paint in his pasture). They stand at a watchful distance and actually seem to take in the beautiful art that is being created. Once one of them actually stole one of Minnows paintings and began running around the pasture with it in his mouth, I think he wanted to keep it and hang it in his stall. Any closing words you think Chincoteague Minnow would want people to know about Chincoteague, art or horses in general? I think Minnow would want everyone to know that painting has become a passion for him, and something that he really enjoys. And after a diagnosis of ringbone (equine arthritis) in 2008 it has given him another purpose since he can no longer be ridden. Now he is enjoying being an ambassador for his wonderful breed, the Chincoteague Pony, as well as a success story for reward-based training methods (which was used to train Minnow to paint). Thanks to Minnow’s owner Kyley for answering the interview and sharing her pony’s art. 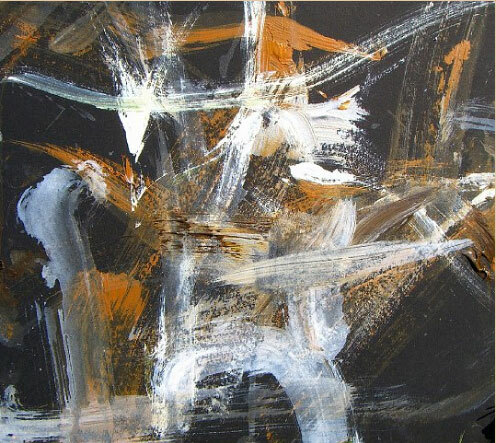 Be sure to check their website perioically for updates about his latest works. This entry was posted in Interviews on May 8, 2009 by The Equinest. Thanks for sharing Minnow’s art with your readers! He’s a one-of-a-kind pony. It was my pleasure Kyley, I hope you’ll keep us updated about him and his work. Why dont you share this wonderful article and amazing pony with trotontv members who would love to read about your fab boy.